There will be Verdi…a lot of Verdi…this season. In celebration of the bicentennial of the composer’s birth in 1813, Los Angeles Opera brings us the rarely performed I due Foscari (The Two Foscari, 1844). The libretto is based on Lord Byron’s play of 1821, which in turn is predicated on actual events and characters from 15th-century Venetian history. Set in La Serenissima in the 1450’s, it concerns Doge Francesco Foscari; his son Jacopo, accused of being a traitor and about to be twice exiled, separated from his wife Lucrezia; and finally a ruling council member, Jacopo Loredano, who orchestrates the son’s exile and ultimately, the Doge’s disgrace and usurpation. Losing his son—who promptly dies en route to exile, although simultaneously exonerated by evidence—Francesco is undermined by the ruling Council and dies of a broken heart. This dark, pessimistic opera (heard the 15th September) really turns on one Foscari—Francesco, Doge (the elected noble ruler) of Venice—embodied in L.A. Opera’s extraordinary production by Placido Domingo. He is one of the reasons this production is just so. The doge is remarkably the singer’s 140th role. Domingo has one of the most important voices—and careers—of the past half-century, and he continues to extend both by his taking on baritone roles in addition to his increasingly frequent conducting. (As many of you know, Domingo began his career as a baritone, but quickly launched into the tenor repertory, and now seems determined to come full circle, ending his career as a baritone.) Last night one could see Domingo revel in the dramatic potential—waning ruler, grief-stricken father—in yet another pivotal, title baritone role previously denied him as a tenor. This career decision has caused some beautiful symmetry in L.A. Opera’s programming. Last season Domingo sang the title (baritone) role in Simon Boccanegra, Verdi’s much later (1857/81) opera about the other Italian Renaissance naval power, Genoa, and its doge. The good news is that in so doing, Domingo has brought a half-century of emotional experience and stagecraft to these roles that are new to him, and has extended his vocal career past its normal length. Top notes are clarion-strong, and the suavity of acting is compelling. On the other hand, Domingo does not have the strength of lower register to project at the bottom of the range. One thinks of Dmitri Hvorostovsky, who commands both the top and the bottom of his register and who creates compelling dramatic characterizations. Hvorostovsky is truly today’s reigning Verdian baritone, whose Boccanegra and Count di Luna are among the best interpretations. That said, I’m fine with the trade-off, as it allows us to have Domingo continue to grace—and I mean, grace—the stage for some years to come. This co-production with Valencia, Vienna and the Royal Opera House, Covent Garden, is yet another reminder of just how fortunate we are in Los Angeles to have the dynamic duo of Domingo and music director James Conlon, accounting for our steady diet of new and recent productions and singers from Europe and elsewhere. The current production is dark and handsome, a unit set with an abstracted architectural shell of rigid white material pockmarked with folds and apertures. It variously evoked Doge Francesco’s ducal ermine collar, the deteriorating façades of crumbling Venetian palazzi, and billowing ship sails (on which the fortunes of the Venetian Republic were founded). Across the upper half of the stage ran a catwalk—like something out of Piranesi’s Prisons (appropriately enough, given the characters literally trapped on occasion within a prison). And even more evocatively, the unit set ‘s fabrication appeared like frozen, folded drapery dipped in plaster like Renaissance drapery bozzetti or studies for large-scale sculpture. At the same time, it brought to mind contemporary architecture by Frank Gehry and Tadao Ando. The good-looking, more-or-less period, costumes shone like jewels within an otherwise somber setting. Two other standouts in the cast were internationally renowned Russian soprano Marina Poplavskaya as Lucrezia Contarini and up-and-coming Italian tenor Francesco Meli as her husband, Jacopo Foscari, the Doge’s son. I had been eagerly anticipating hearing Poplavskaya in person for the first time, already having admired her broadcast performances in the Covent Garden/Metropolitan Opera production of Verdi’s Don Carlos. There her cool exterior clashed with her ardent characterization; her ability to spool out floating pianissimi as well as fearlessly belt out her top notes joined an impressive coloratura. But last night in the first act, the soprano’s voice began slightly unfocussed, gaining in intensity and drama by the time of her duet with Domingo at act’s end. The coloratura was in place, but Poplavskaya somehow didn’t sound quite comfortable yet in the role. I suspect she will warm to the task over the course of opera’s run in Los Angeles. Jacopo was ferociously sung by Meli with a ringing tenore, but he was not up to the rounded, honeyed sweetness of José Carreras in the classic 1977 recording (with Lamberto Gardelli also conducting Piero Cappuccilli, Katia Ricciarelli and Samuel Ramey). Conlon conducted the music beautifully—the orchestra sounded terrific—and the performance musically cohered in a way—at least for me—that 2010’s Rigoletto did not (despite Conlon’s conducting and the presence of two terrific voices, George Gagnidze and Sarah Coburn as the father/daughter duo). This is the “hit-and-miss” experience, I think, with earlier Verdi. It runs the danger of breaking up into set pieces à la bel canto opera, coming off sounding a bit “oom-pah-pah.” This was brought home to me recently, having attended last February the Met’s production of Verdi’s Ernani (composed earlier the same year as I due Foscari). Here in The Two Foscari, perhaps because the opera is more about atmosphere and inner emotion than lots of incident, and surely because of Conlon’s fine conducting, the end result was more seamless, coherent, and dramatically—at least to modern ears and eyes—more satisfying. An odd note to young American director’s Thaddeus Strassberger’s otherwise efficient staging. In the production’s final moments evidently the curse of the Foscari strikes a third time, for as Doge Francesco lay dying, his young grandson simultaneously collapses in his mother’s arms in some sort of fit, dying face down in a puddle of water. It really upstaged Domingo’s moment and proved confusing, as well as extra-textual. 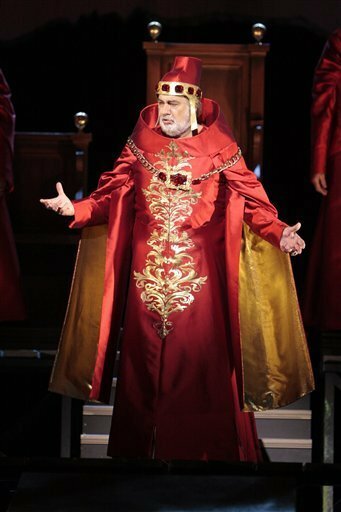 The Two Foscari may very well be the greatest of Verdi’s early operas—only his sixth—with its intimations of the great works to come: Rigoletto, Trovatore, Traviata, Forza del destino and even the psychologically penetrating masterpiece of operatic literature, Don Carlo (in some of the characterizations as well as the moving cello introduction to Act II). This musically sophisticated and dramatically taut opera presages the great dramas to come from Verdi’s pen. Go see L.A. Opera’s production, the first major staging in the U.S. in over forty years. No two ways about it (sorry, pun intended), it is an occasion not to be missed. When I think of Jacopo, I don’t desire “honeyed sweetness.” I think Meli gave a masterful opening night performance of the role.